Caters who utilize a BBQ menu can benefit your next corporate or personal gathering or event in several ways. People from all over the country enjoy BBQ food mainly because it is the ideal food to have served outdoors. Like with any catered event, the better the catering company, the better the food, service and overall experience. Another benefit of choosing BBQ for your event is that you can satisfy both meat eaters and vegetarians. 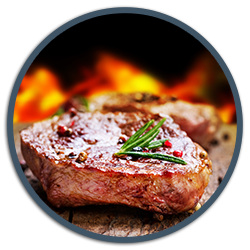 Meat lovers are easily satisfied with burgers, hot dogs and steaks. Vegetarians can enjoy veggie burgers, a variety of salads as well as fruits, vegetables and fresh breads. That is, vegetarians can dig into all the pasta salad, Asian noodle salad and focaccia wedges their hearts desire. It is also possible to cater BBQ food to those with food allergies. BBQ caterers can feed large amounts of people without gouging your pocketbook. BBQ is ideal for any outdoor gathering or social events. Since caterers have their own mobile stations, it is easy to facilitate the cooking of the various items. Consider choosing a BBQ menu the next time you need an event or gathering catered. A Catered Affair offers buffet choices with the freshest ingredients. Our Angus all-beef burgers are so juicy, we recommend at least two napkins per person. We top our burgers with multi grain and whole wheat buns that are freshly baked. Top off your fabulous burger with freshly sliced tomatoes, dill pickles and spicy banana peppers. And don’t forget to throw a slice of natural cheddar cheese for added flavor and texture. Try our BBQ catering services for your next event.